Trip Day 6: It was a short day, starting with an early start at 4:30 am, the aim was to reach the Zambian boarder crossing before all the traffic got there and another Acacia truck we knew of was heading to the same crossing with 23 people aboard. If we got stuff behind them it would have taken ages. After the short drive we checked out of Botswana, checked ourselves then Rumphi onto a ferry for a river crossing over the Zambezi. The point where we crossed was pretty interesting as it was where Zambia, Botswana, Zimbabwe and Namibia meet and you could clearly see all the different land masses as we sailed across. At the other end we went through immigration and a little queuing, but then whilst waiting for Justin and Dennis to get through and sort their vehicle permits out we get harassed by the locals trying to sell us stuff. We locked ourselves in the truck, but it didn't stop the local mob banging on the windows and calling us "terrorists". Luke (22 yo, Aussie) tried his best to make friends with antics for his coconut monkey mascot that he was travelling with. After another 2 hours drive to Livingstone, we stopped quickly for supplies and an ATM. Then another short drive away was Victoria Falls, on the run up to it you could see the massive spray cloud where the water had crashed into the floor after it's drop. You could see this cloud up to 80 kms away. When we got there we were told we only had 1 hour at the Falls which was frustrating as we already knew we wouldn't see it all and would have to rush. 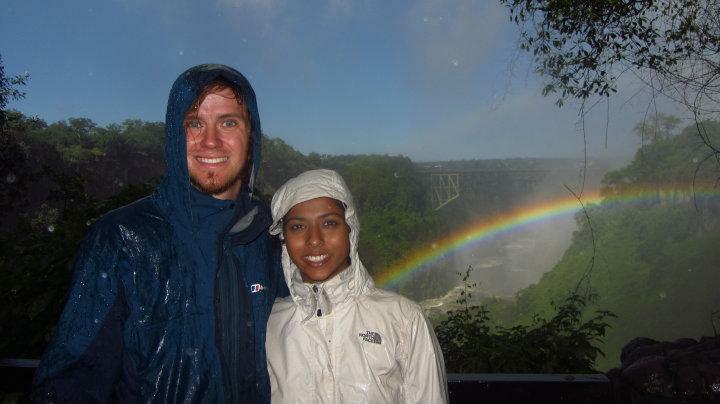 The walk around Viccy Falls was amazing however, we saw so many rainbows created in the falls, we even walked/ran through the arch of a few and saw where larger rainbows started / hit the ground - no pot of gold though. After walking along the lush green path getting soaked from the spray (lucky we had good waterproof jackets), we decided to brave the "Knife Edge Bridge" which was a thing bridge linking two outcrops of land over where the falls lands. As you can imagine we got drenched. We slipped and slided across the bridge holding onto the rail whilst spray drove into your eyes making it impossible to see much and the roar from the falls made it impossible to hear as well. We went across with a Korean girl from our trip called "Heyan" and her designer sunglasses came off and slide into the falls. Over the other side of the bridge offered some shelter with trees and bushes. The others went back across but Alicia and I decided to explore a little more. We walked to the very edge of the falls as far as we could go, unfortunately the view from the end was obscured by mist. At no point did we see the bottom of the falls either, the water so just too fierce, it was still so loud that we had to shout just to be heard. As we wandered along we alternated between walking in the shelter of the trees and the exposed rock on the edges of the tall outcrop looking at the falls. As we neared the end we looked at our watch and our hour was nearly over already so we had to hurry back to the truck. We completely 1 of the 3 walks and it's a massive shame we could have done more in hindsight (considering it turned out what we were rushing to get to was a sales meeting). The Zimbabwean side of the Falls is supposed to be better with a direct view of the falls, we saw a lot of people over there but because Acacia is a British run company, they decided it'd have been too dangerous for us to go. We still had an absolutely fantastic time, everything about it was impressive, even when you weren't looking at the falls, there was still various gorges, surrounding scenery (and rainbows!). Immense. When we felt Vic Falls, we were on a bit of a high. We drove to the nice looking campsite called the Zambezi Waterfront but was hurried straight into a sales meet which totally burst our bubble, none of us were particularly happy that this is why we left Vic Falls, especially as all the trips they offered were MASSIVELY overpriced. The only thing I had down that I really wanted to do was the Lion Encounter, but then we were told it was $143 for only 1 hour (considering we only paid $10 for a full day trip and travel - including the Tiger Temple, - in Thailand). Alicia and I spent much of the rest of the day debating whether we should just do it but we just couldn't justify it. We decided to spend the rest of the day putting up our tent (in the middle of the pitched to avoid the infestation of ants) and relax by the pool. At 6pm we had our pre-departure meeting for the next trip where we met our new tour leader, driver and group. A couple of people were the carrying on from our group, Anina (German) and Sarah. We heard our itinerary and plans for the next few days and it helped lay to rest some fears we had. Firstly the group coming down in this truck from Kenya had 24 people on it (completely full) and was labeled the drunk naked bus. We thought we'd be going from one extreme to the other, but our group was relatively small of 11 or so and seemed chatty and friendly. After the meeting we had dinner with the rest of the group. Luke's passport got irreparably wet at the Falls. For some reason he took it with him in a ziplock bag but the bag had a hole in it and it got absolutely ruined. Not only was he pretty upset that the passport he was so proud of was destroyed, but now he was stuck in a country without an embassy. He had spent all day on the phone to different countries as he couldn't leave Zambia let alone get into any other country. He had successfully bribed his was a route out of the country until the Australian Embassy ratted him out to South African authorities (despite the Aussie embassy adviser say "that's exactly what I'd have done" re: bribing) and the S.African police said they'd arrest him and detain him for a minimum of 24 hours before any embassy could get to him and it'd cost him $150 per hour for the privileged. He'd booked a scenic flight over the falls that'd had booked for the entire trip, but he had to cancel it to try and sort transport home. Despite his best efforts, it wasn't resolved by the end of the day. Trip Day 7: We were looking forward to lay in but we had to be up for 7:30am to pick up our customised tour t-shirts. $25, but money well spent, they looked great. We showered and hand washed some clothes then went to the restaurant for a buffet lunch. We met a couple of lads from the trip from Nairobi and one that was continuing with us down to Cape Town. We went to the swimming pool for the rest of the morning with Sarah, we saw a big water monitor lizard walking around. We were joined by Zoe and the two lads from the Kenya trip. As time passed Alicia and I made a snap decision to sign onto the Livingstone Island trip for $102 dollars. We weren't really sure what it involved but we'd been recommended it by someone on the Chobe river cruise and we both really wanted to go back to the falls again. We took a taxi over to a 5 star hotel near the edge of the falls called the Royal Livingstone, we saw a giraffe wandering around it's grounds. We didn't really look like we fit in at the hotel. We took a speed boat with 2 other older ladies down river (heading straight for the edge of the falls). Once disembarked we were shown the "loo with the view", got a tour of the eating area only 20 meters or so from the edge of the falls then we got changed into our swimming clothes and headed with our guide out along the small island to literally the very edge of the falls (this was the only spot on the falls that wasn't underwater). The famous Devils Pool was closed as the currents were too strong due to the fact it was wet session, but we were told that we could got for a swim still if we wanted. Alicia was scared, but rightly so, we had to wade through the fast flowing water balancing on uneven, slippery rocks to get to the patch of "dead water" (i.e. no current). Relief when we finally made it across the rocks then we literally jumped in only 4 meters away from the edge of the falls. The guide took photos of us as Alicia tried to make he best "not scared" face for the pictures. It was all very cool. Unfortunately we still had to make the trip make which all went without a hitch. We walked for literally a minute over to the other side of the island where we could walk to the very edge of the falls and look over the edge. It was amazing, there was no barriers or handrails, you were just there at your own risk, I also had the 2 older ladies shouting at me to come back lol. After I got a couple of pictures from hanging the camera over the edge of the falls and a couple of photos of us stood there we walked back to the eating area for a spot of "high tea", we had a couple of beers / glasses of wine, steak rolls, scones, brownies etc and talked to the other people on the trip. After the tea we took the speedboat back then a taxi back to the campsite. In the evening we had drinks to say goodbye to the remaining Rumphi group and to get to know the new group a little more. It transpired that after another full day on the phone Luke had a way out. He had to go over to Zimbabwe then take a 15 hour night bus across the country to an embassy then get a flight to Jo'burg, then home to Oz (rather him than me! ).